A personal record of my walk of the Yorkshire Dales Celebration Way with written journal and photographs. Tracklogs for GPS units and for use with Google Earth are available for download for each stage. Summary: This shorter stage of the walk begins by leaving Ingleton and walking north through the beautiful Swilla Glen visiting the delights of Snow Falls, Pecca Falls and Thornton Force. 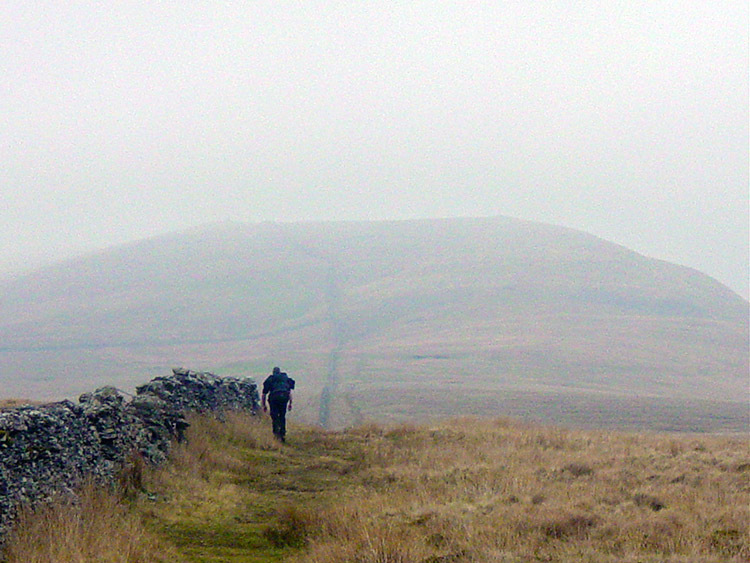 After this enchanting start there is a stiff climb to the summit of Whernside. 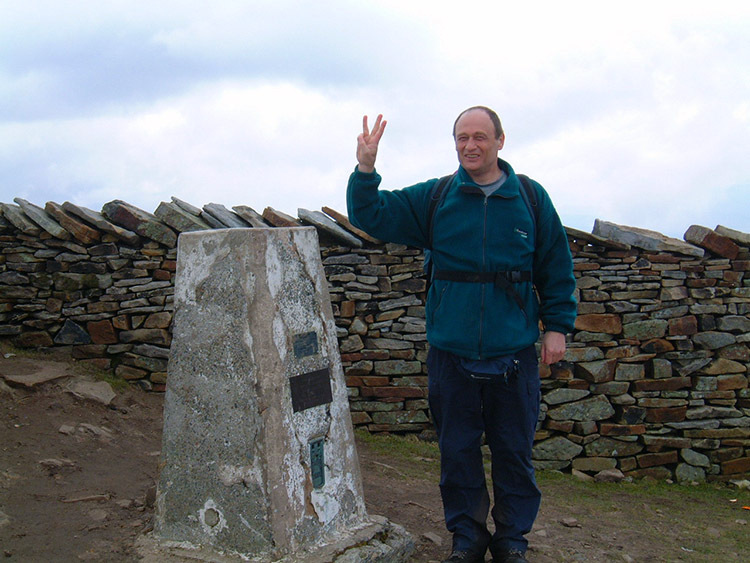 The Three Peaks are completed now as the walk makes its way off Whernside by heading down due west to High Pike and along green lanes before making a descent into the picturesque and fascinating cobbled street village of Dent. This is a classic isolated Dales village to enjoy on an overnight stay. The Walk: And now we were down to two, Chris having left us after completing the stage into Ingleton. I can't recall what we had for breakfast. I can't even remember waking up but I do recall thinking that I would stay at the Seed Hill Guest House again. Seed Hill, an quaint old grade 2 listed building was our accommodation in Ingleton. Our host Adrian and his wife were lovely friendly people and most importantly they recognise long distance walkers as an important part of their market. Not all Guest Houses do especially when you tell them you want to stay for just the one night. Anyway, thank you Adrian. I will recommend you anytime. Now let's get walking. Steve and I usually make a stuttering start to the walking because we first have to locate a shop and stock up with food and drink. It is likely that Steve will get a Lucozade (and/ or Red Bull) and another less charged drink plus a Cheese Pasty and a chocolate bar. I buy much the same but will often add a Scotch Egg and Sandwich to the fayre. And so, stocked up for the day off we go. The start to today's walking is superb although there is a small price to pay. 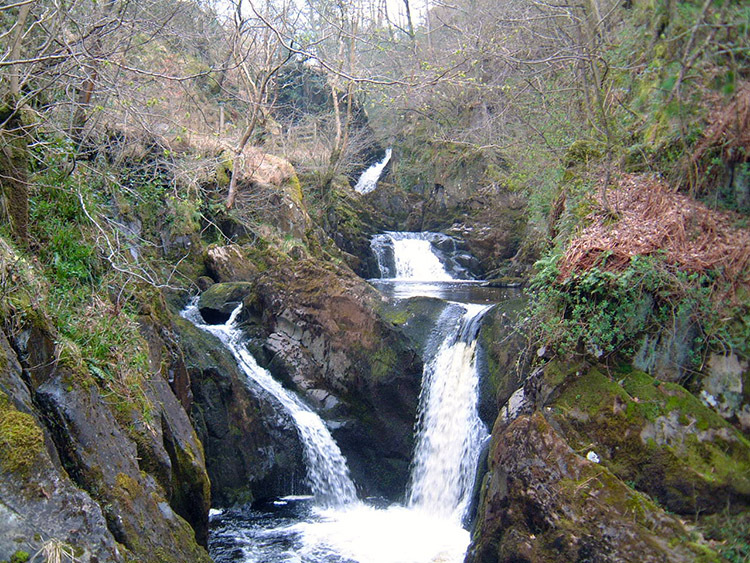 We walked from Seed Hill via the shop down to the start of the Ingleton Waterfalls Walk. To follow the path we must pay £3 each (2004 prices) but the cost is well worth it. 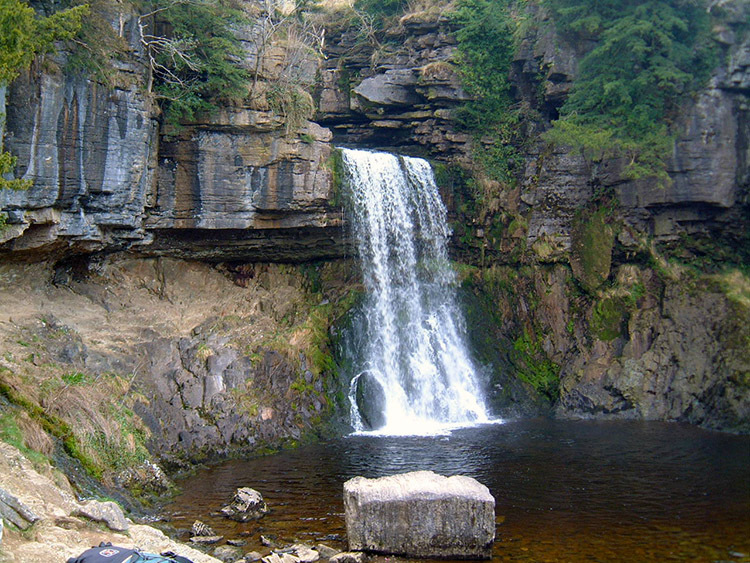 The charge is to maintain the paths and walkways on the walk for this is one of the most popular ones in the Dales with thousands of visitors each year coming to view the spectacular falls. Cost=fair enough in my opinion for the paths are well maintained, not like the disgusting Green Lane track of which I will tell all about later on in today's walk. We paid our money at the entrance to the Waterfalls Walk and made our way alongside the River Twiss. The first part of the walk was relatively flat which was good. We had a climb ahead. Steve walked on and up, I trudged a short distance behind, on and up. Eventually we reached Combe Scar and blue sky welcomed us. 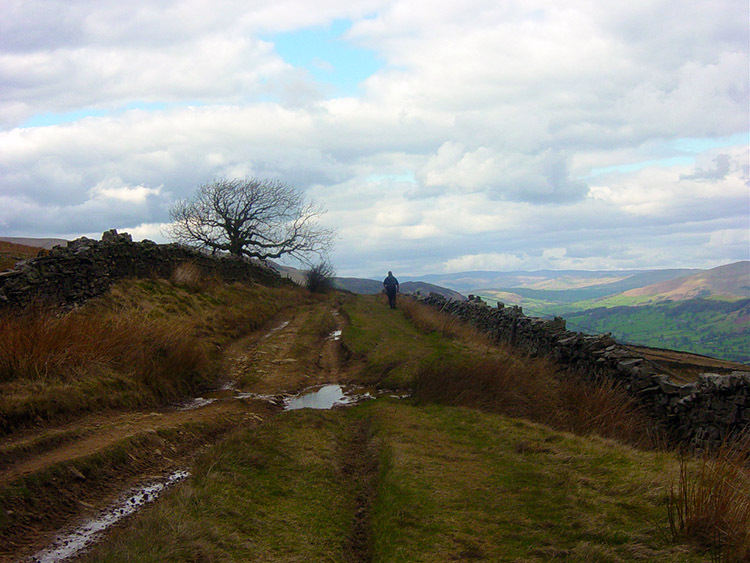 We saw where the steep path from Chapel le Dale reaches the ridge. That painful steep path we have gone up and down many times. I have slipped on it going down on more than one occasion, it's steep and it is nasty and probably the worse part of the Three Peaks Walk. Glad it is not on this one! We walked from Combe Scar to the Three Peaks path and chatted to two gents sheltering by a wall having a break. The weather was improving now and the sun was breaking through, seemingly heralding our triumphant walk up the final pull to the top of Whernside. As we walked the final climb we began passing people. It was Easter Monday now and they were possibly doing the Three Peaks. One mature couple passed by and passed pleasantries. Just as I walked away from them there was a noise followed by an exclamation. The gentleman had fallen badly but seemed OK, more embarrassed than hurt. He got to his feet quickly and dusted himself down. I walked on a few yards, Steve now a few yards ahead of me. After those few yards I looked back to see if he was alright and saw something I did not expect. The chap was walking off, he was fine but his partner had stepped off the path. The path is a busy one, on the official Three Peaks path. It was Easter Monday. People were around. And yet she had stepped off the path, stooped down and dropped all in full view of walkers. You see all sorts of unexpected sights while out walking! I turned back to look at my final climb to the trig point and followed Steve up to the top. We had now completed the Three Peaks, albeit in two stages. We relaxed on top of Whernside for some time. The clouds were continuing to break and we felt good for our walk down from Whernside into Deepdale would be in splendid conditions. Deepdale would lead us to Green Lane. As soon as we had left the ridge of Whernside and started to drop into Deepdale Steve spotted some hang gliders to our right. They were enjoying a bank holiday flight along the rump of Whernside. There were three of them. At first they were some distance away but they were soon gliding towards us. The first one seemed in full control and made turns effortlessly. The second one was also in good control of the hang glider but the third appeared less skilled. Steve and I both noted this. 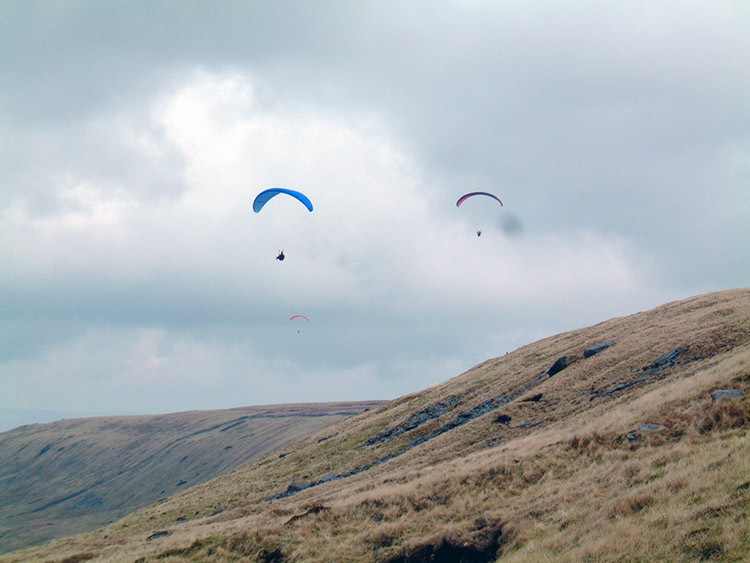 The gliders were heading to a landing spot near a van at the bottom of our descent path on the Ingleton to Dent road. As we got lower so did they. Our observations were to prove correct. The first glider landed close to the van. The second glider landed a little further away but within 50 yards. The third landed at least 100 yards away and so had more work to do in wrapping up the hang glider and carrying back to the van. He was still there before we arrived though and they were all packing away their gear as we passed by. I felt sorry for them as we passed. Not because of the hang gliding, I am sure that is good fun for them. I felt sorry when I read the stickers on the van and their other vehicle. They were Castleford Rugby League supporters. Castleford will almost certainly be relegated this year. I did not dare mention I was a Leeds Rhino's fan. We walked along the road to High Moss where we would join the Green Lane track although Steve tried to get me to short cut up a field directly onto the track at High Pike. The field looked a bog and I refused. We arrived at High Moss and cut off the road onto the Green Lane Track that would take us around High Pike and around Little Combe Hill into sight of Dent. It looked easy on the map, no climbing, just a gentle level skirt of a hill on a bridleway. So we began our walk on the bridleway and before we go to the final passage of today's walk please note I had never walked on the Green Lane track before. I will never walk on the Green Lane track again! Not unless there are some serious improvements made to it. It all started well enough but it was not long before we began to have to meander in zigzags to avoid the ever increasing pools. After we rounded High Pike we reached an area called Foul Moss. An apt description for the walking was getting foul on the bridleway and we chose to leave it and walk across the fell to cut off the corner near Blea Gills. The fell was no better and we rejoined the bridleway. The view of the bridleway ahead was the most awful sight. 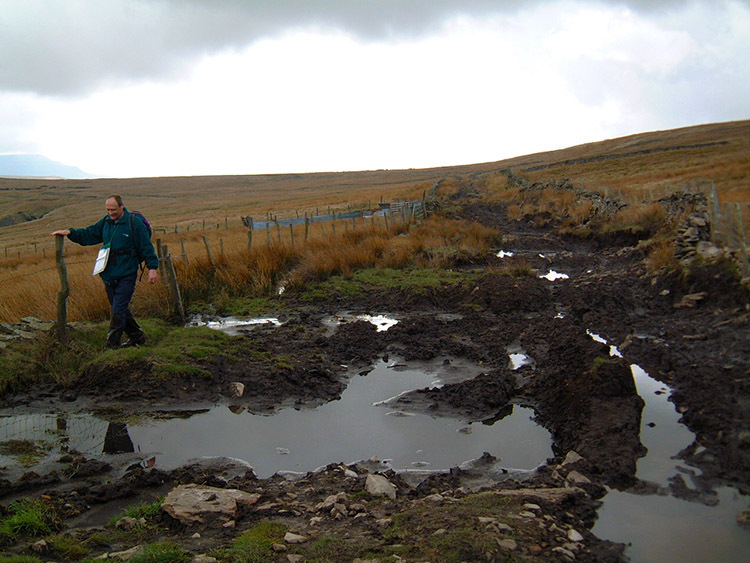 It was a quagmire churned up by off road vehicles allowed on Green Lane. Steve exclaimed "This carnage makes me want to destroy all offroaders". I agreed. The result was that Green Lane was not green at all as the picture of the track on this page clearly shows. We were forced to walk on the edge of the bridleway and had to frequently wade across from one side to another. 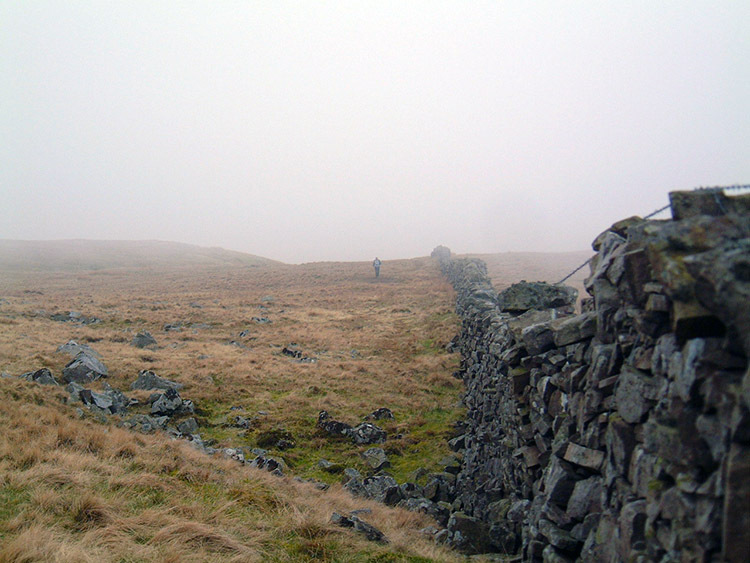 We sometimes had to leave the bridleway altogether and walk on the fell side. We were both soon blathered and inevitably I soon took a step where my foot descended deep into the mud. I was up to my knees in it and it took some effort to pull myself out of the mire without losing a boot. 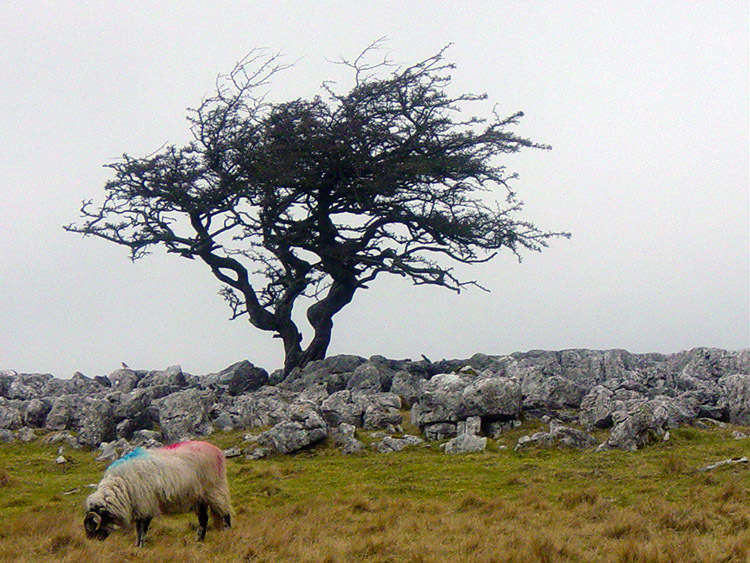 It is the worst walking I have ever done in the dales, no doubt about it. If it is not high summer then do the Boot of the Wold walk on the Craven Way into Dent. Don't attempt this. We met a large group of walkers with dogs and children coming from the other direction. We warned them of what was ahead. They listened and some looked reluctant to go on but go on they did. We later looked back and saw them struggling. They were warned. Finally it was over and we sighted Dent. Soon we arrived at a fork which took us down a lovely hard track through woods to the village. 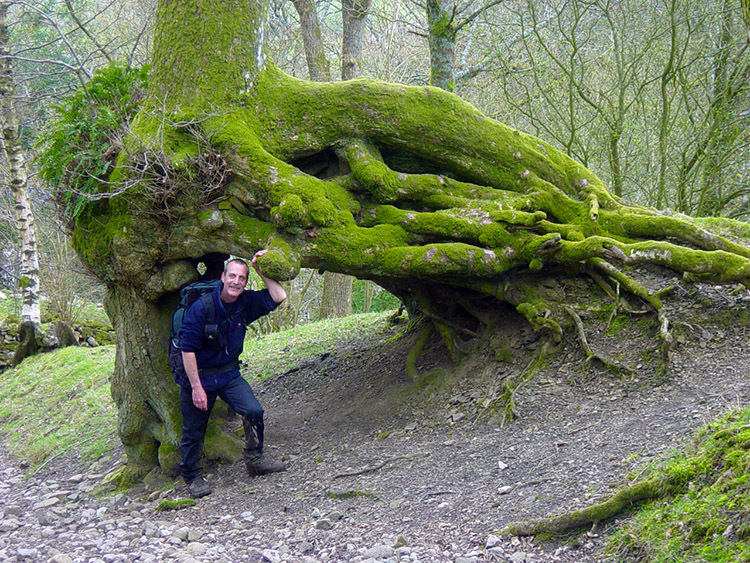 There were some spectacular trees near the bottom with amazing root structures (see picture) In dent Steve went straight to our digs at the Sun Inn. I went down to the river and waded in. I spent a good quarter hour cleaning the mud from my trousers and boots. I had to, I couldn't possibly go into the pub in the state I was. What a great start to the day we had today on the Waterfalls Walk. We then enjoyed the climb up to Whernside and down past the gliders. And finally I will always remember my walk on the not so Green Lane!